We cannot argue the toss that the life of an army officer is not only tough but also filled with uncertainty. Just like any port in the storm, the army officers grasp at straws while battling against death. 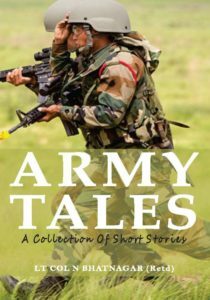 ‘Army Tales’ gives us a glimpse of those moments of pathos, violence and trauma when the sound of bullets and tanks becomes louder than any other sound. The book is a collection of short stories or rather instances that narrate those little meaningful and memorable experiences. Slapstick humour clubbed with genuine emotions can be seen throughout the book. I finished the book in one go owing to lucid narration and trouble-free dialogue delivery. However, there are two factors that disappointed me the most. First, Leadstart sent me a used copy of the book that had pages folded inward and comments written on the sides. This was unexpected. Second, the book has a lot of errors. Right from grammatical mistakes to the typing errors and the missing words- everything is haywire. I wish the book was carefully proofread! Overall, the book is an intense read and will leave the readers with some insightful musings.